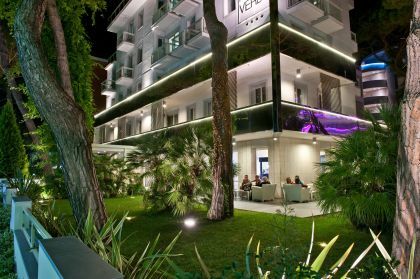 Surrounded by lush gardens and just 50 metres from the beach, Perla Verde Hotel is also close to the town centre and 5 minutes’ drive from the Adriatic Golf Club in Milano Marittima. 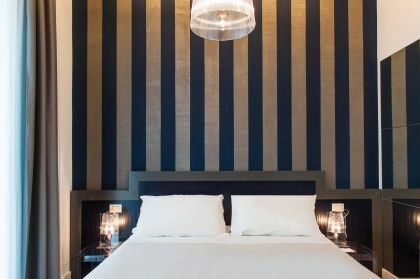 All rooms have shower cubicle, hairdryer, personalized complimentary toiletries, LED TV, telephone, safe, mini-bar, air-conditioning and/or heating and a small balcony. 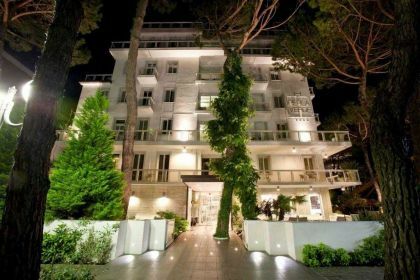 Exquisitely designed in contemporary style, the spacious suites and junior suites offer splendid views of the sea and the pine forest and add further to the elegant and comfortable feel. Mornings at the Perla Verde begin with a rich buffet breakfast, with our chef on hand to prepare freshly-cooked eggs, crepes and pancakes. 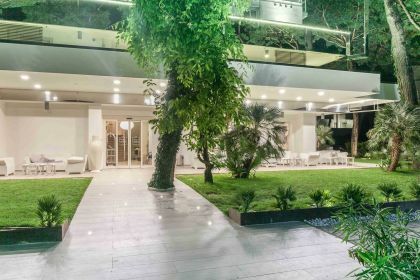 And at lunch and dinner, the hotel’s Verdepuro Restaurant offers a vast selection, ranging from more traditional to more innovative dishes that deliciously mix a la carte menus and live cooking, all accompanied by a fine wine list. Personalized menus can be specifically created to satisfy the most varied dietary needs. Those who love relaxing will delight in the exclusive Essentia Spa wellness centre, complete with a Gymbox fitted with hi-tech equipment. 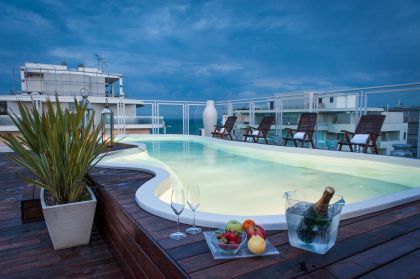 The heated pool (15 m²) and solarium on the hotel’s roof top offer privacy as well as breath-taking views. Beach towel and bicycle hire, for the more active, are available free of charge and free wi-fi covers all rooms and public areas.